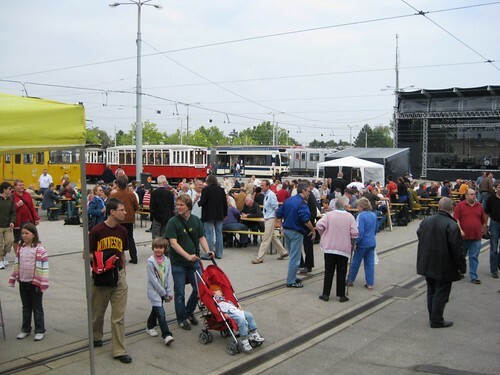 On Saturday the Wiener Linien (Vienna Lines), the city’s public transport operator held its annual open house at the main workshops. It was a nice day and a great party. Here are a few photos. 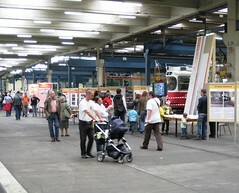 Inside the railway vehicle maintenance area. 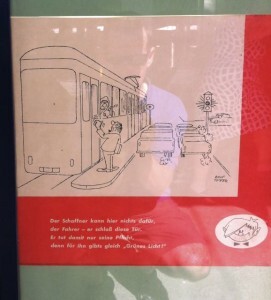 The Wiener Linien had set up displays of interesting information (how the new real time passenger information system works, etc) with various types of public transport vehicles interspersed between the displays. 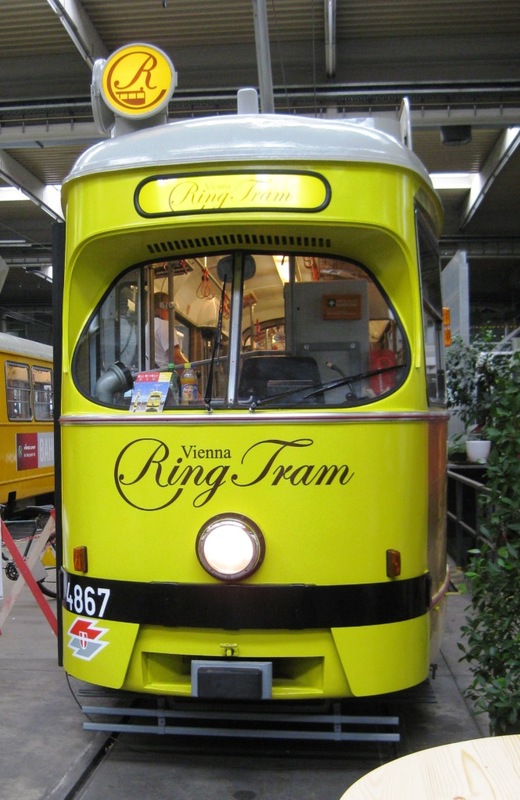 The new Ring Tram was on display. The tram lines that used to run on the Ring (#1 and #2) were recently re-routed so they only go on part of the Ring. 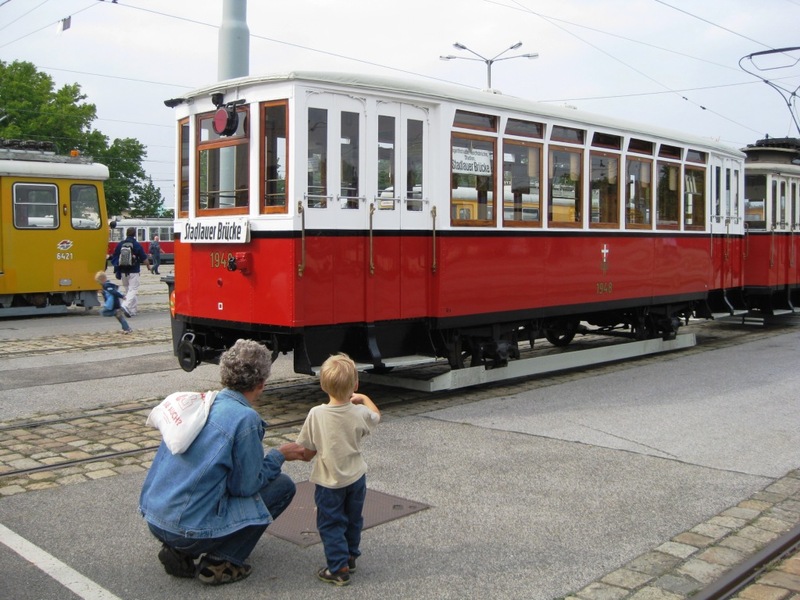 The Ring tram is designed for tourists and has information in several languages available on headphones. 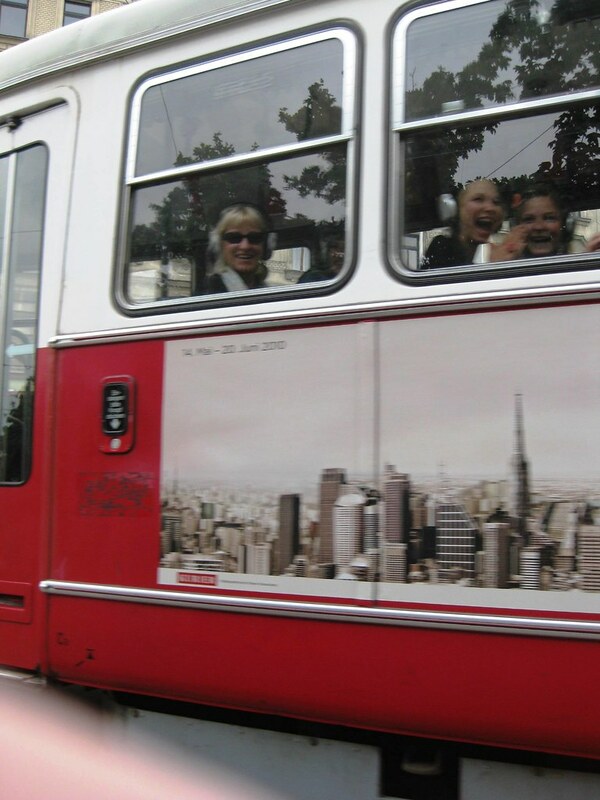 It has a special (higher) fare, but it’s well worth riding. What is it about kids (of all ages) and trams? No Austrian event would be complete without food and drink. 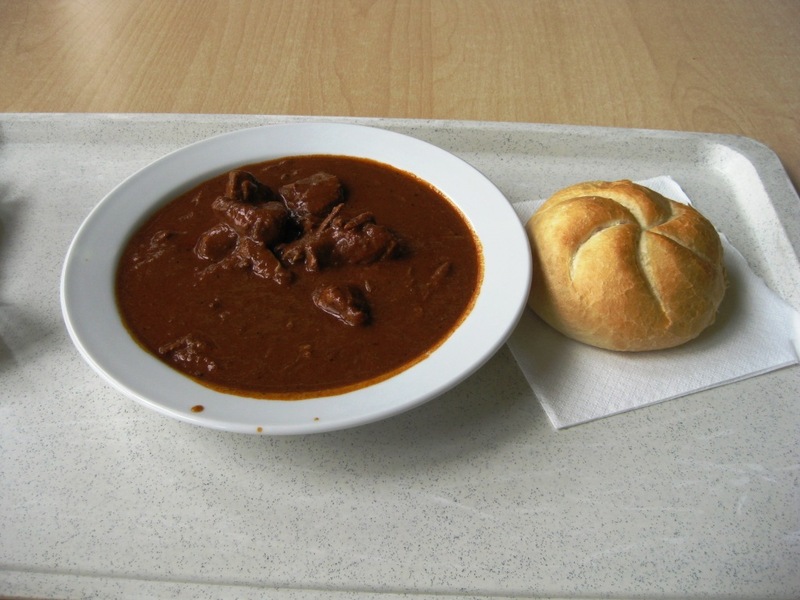 Below is my Goulash lunch at the employee cafeteria … not as good as mine, but quite good. Back to work … here’s a photo of several rail vehicles being maintained. 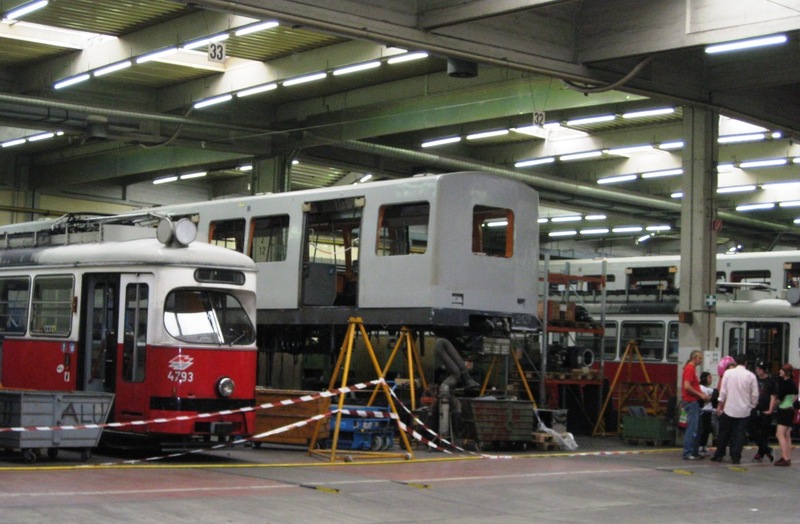 On the left is one of the old trams, on the right (up in the air) is one of the old subway (U-Bahn) cars. I don’t know how many public transport operators have their own Blues Band, but the Wiener Linien does: the Wiener Linien Blues Band. 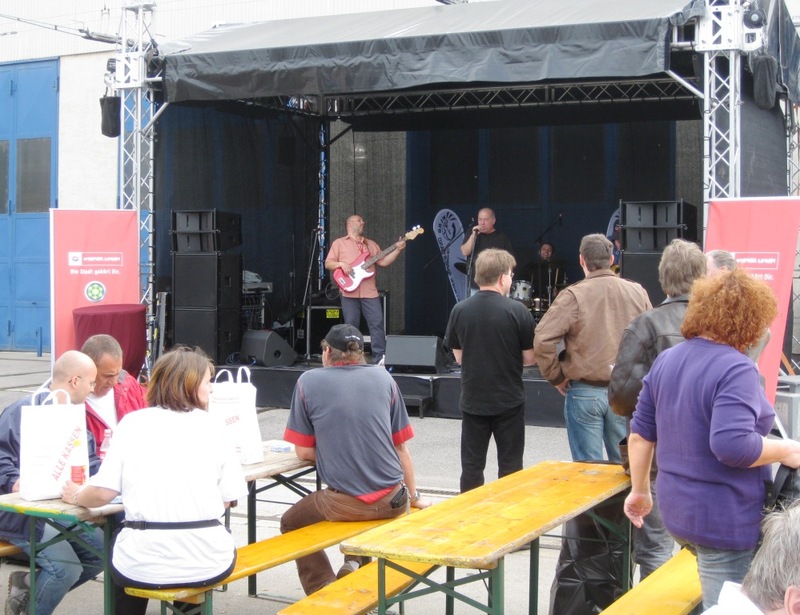 They were playing Mustang Sally, I don’t know why they didn’t play Tramway Charlie … but maybe next year! 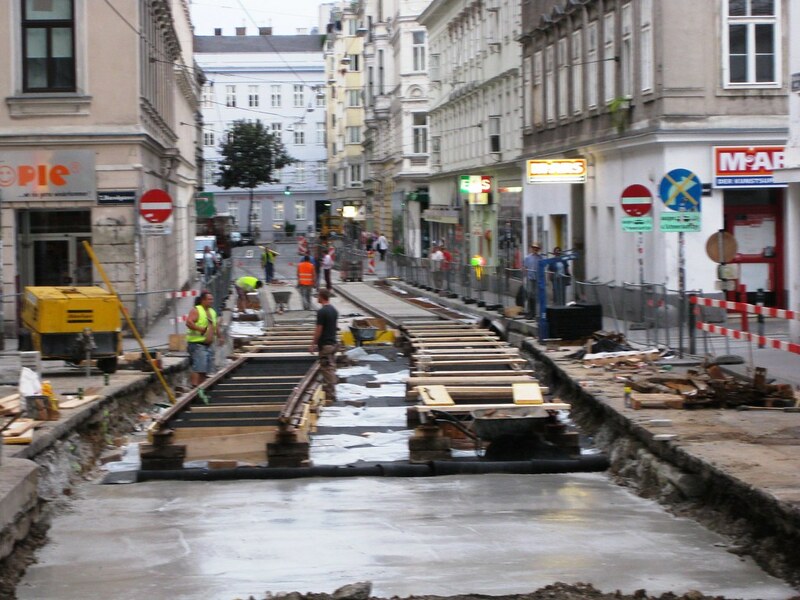 One reason building or rebuilding tram track in cities is difficult is that the track is rarely exactly straight. 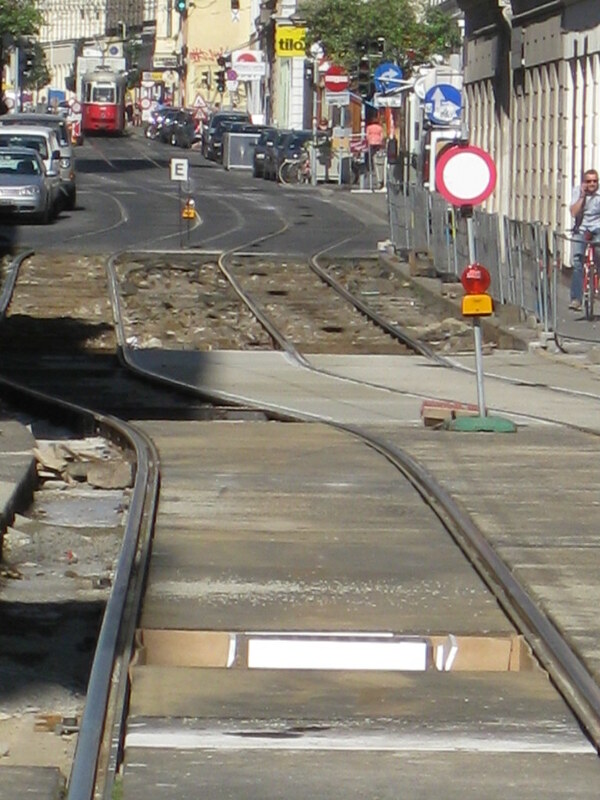 Also, in cities like Vienna where there are many tram lines there are many places where one set of tracks crosses another and many places where switches are needed. 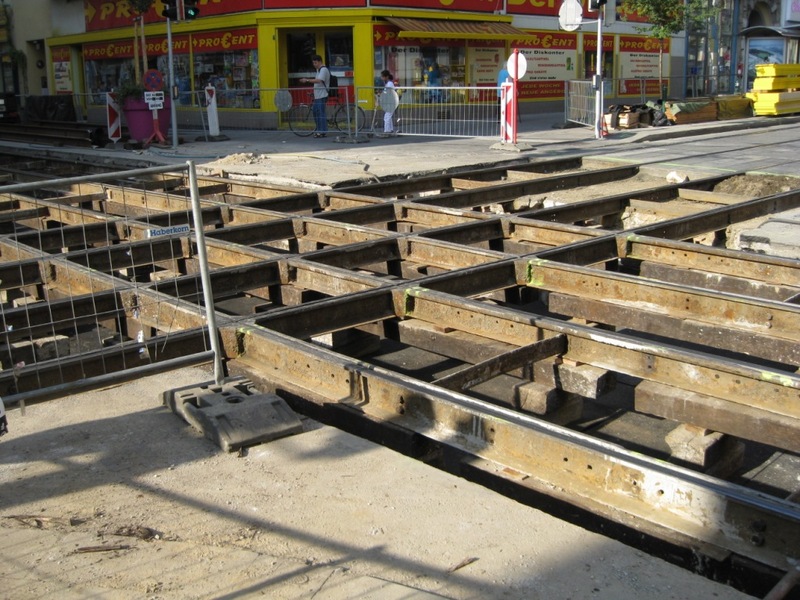 As these photos show, Westbahnstrasse has examples of all these problems. 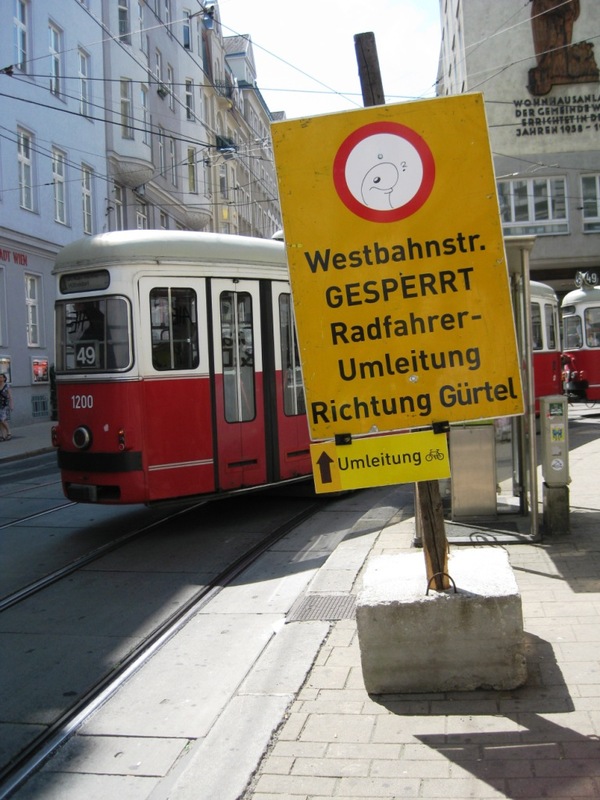 From left to right: it starts with the Neubaugasse “S” curve as the tracks change from Siebensternstrasse to Westbahnstrasse, then on Westbahnstrasse the tracks shift a little as they head west and at Kaiserstrasse there is a complex intersection with two tram tracks on each street. Check out my video Riding Tram 49 at Night for an impression of riding the line from the Ring to Zieglerstrasse. 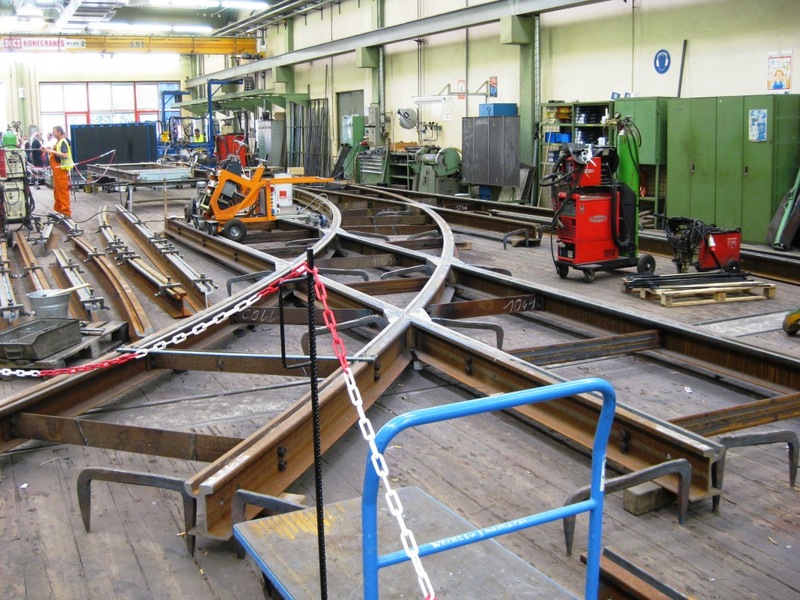 Most of the complicated trackwork, like the three examples above, must be made in a workshop with machines that enable rail to be cut into complex shapes, bent into very precise curves and fitted together. 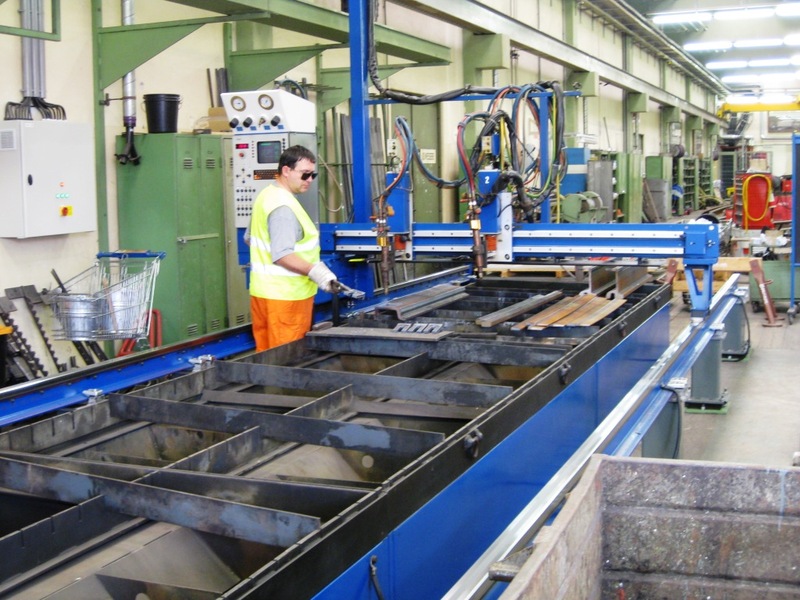 Then the finished sections of track are brought to the worksite and welded to the adjoining rails. The big advantage of this approach is that it takes much less time and leads fo much higher quality track. 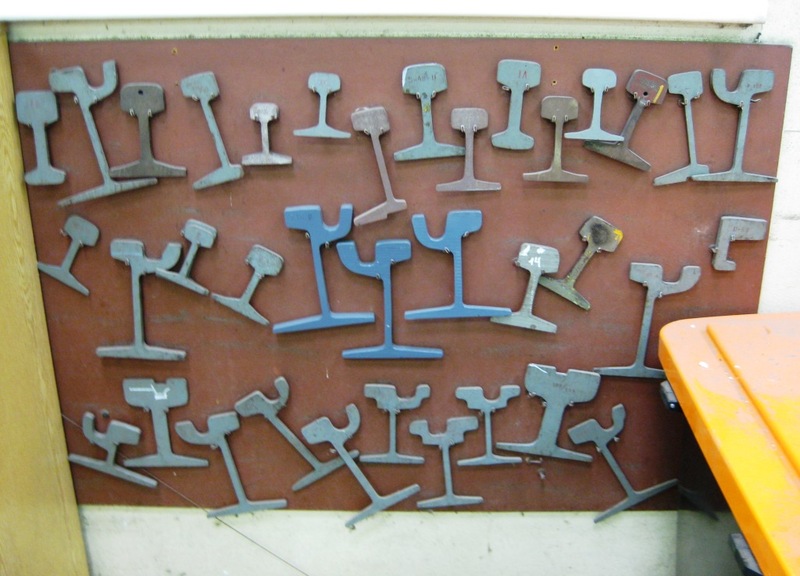 Mainline railroads use the same method: prefabricating complicated track sections, removing the old sections and replacing them with the new ones. 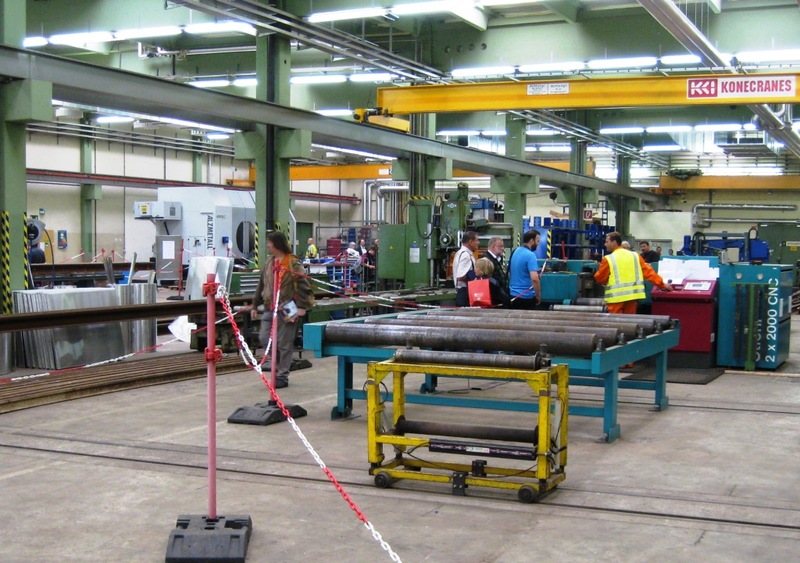 The Wiener Linien has its own workshop for prefabricating track sections. 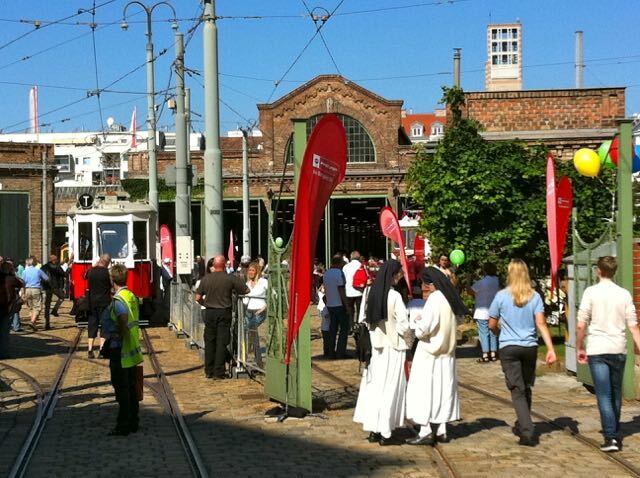 I visited it last year at the Wiener Linien’s annual Tram Day celebration. 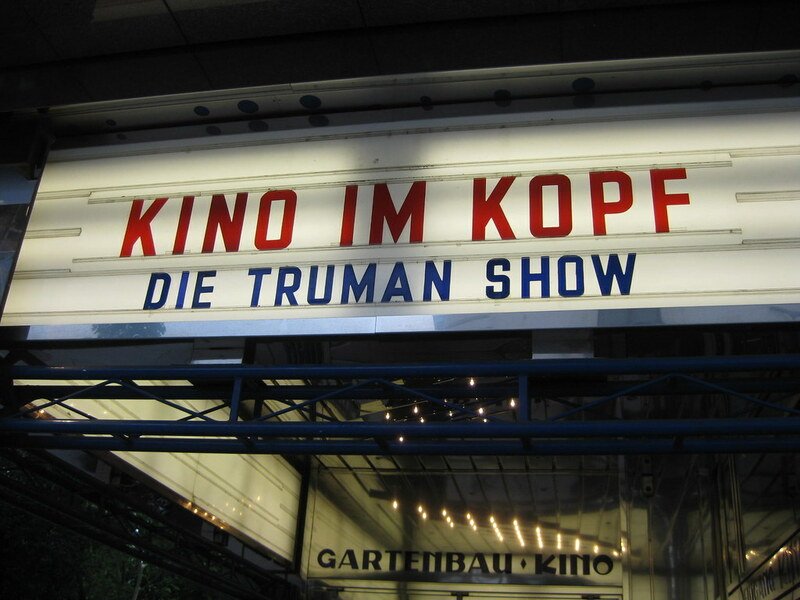 The photos on this site are all from that visit. All photos are available on my flickr set Westbahnstr Tram Track Renewal and you can click on the photos to see larger versions. Here is a switch being fabricated in the shop. 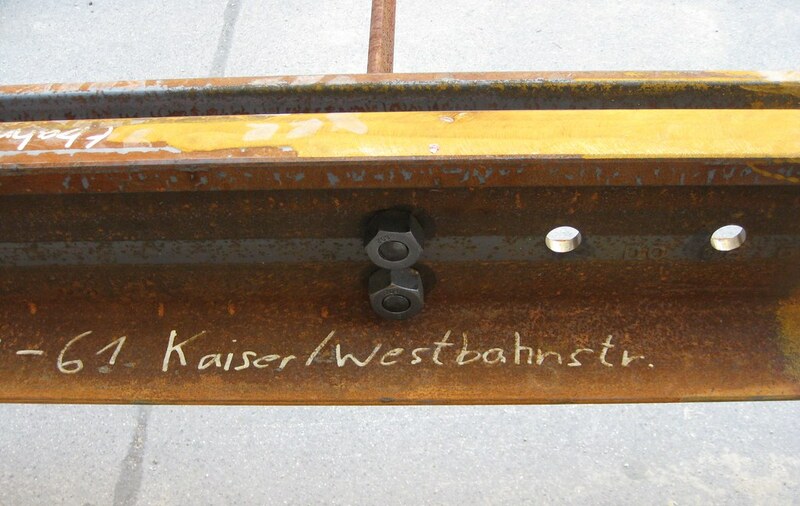 Notice the devices pinning the rails in place while the complete structure is being built. 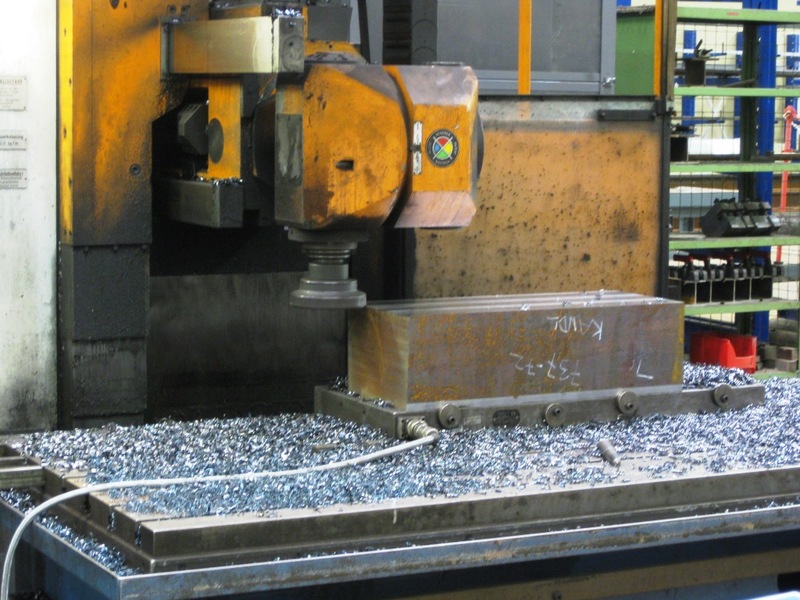 This machine is milling a block of steel that will be part of a switch (probably a “frog” the point in a switch where the two rails come together). Since the rails are created for a specific location they are all marked. Another shot showing the track curvature looking down Westbahnstrasse towards Neubaugasse.